See the Virtual Museum 1780s for a lease on a house in East Street, owned by the Earl of Oxford with William Fabyan as tenant. Above: Peter Fabyan Sparke's signature and seal. William Pope married Lydia Smerdon on the 17th August 1824 at Ashburton. On March 24th 1874 Mrs. Lydia Pope died, aged 77. She was the only surviving daughter of the late Thomas Smerdon. In 1838 John Sparke Amery married Frances Windeatt in the Totnes registration district. In the 1841 census they are living at Druid, and John describes himself as a sergemaker. They have a one year old son, Peter. 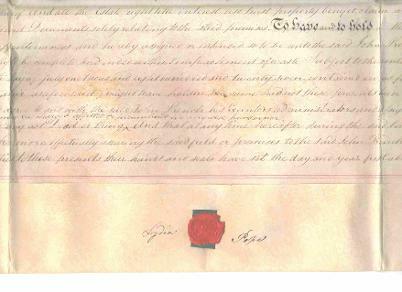 See http://www.glanvillenet.info/will014.htm for the will of Mrs Joanna Adams. Roger Halse is described as a cousin. 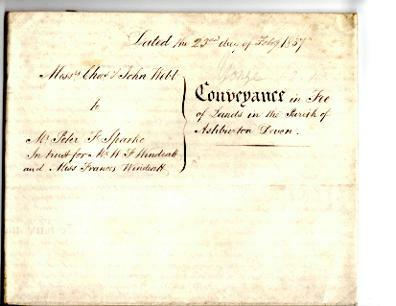 Left: 'Mem of terms for selling a freehold dwelling house in West Street, Ashburton, Devon, the property of Miss Elizabeth Halse of Devonport, described as No. 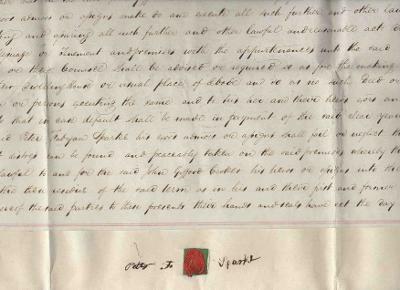 3 in the will of late Mrs Joanna Adams. The property is freehold and being held by the vendor under the will duly proved of her late father Mr Roger Halse, who died January 4th 1848, to whom it was devised by the will of Mrs Joanna Adams, whose will was duly proved on 23rd July 1840, the title shall commence with the said will of Mrs Adams aforesaid, and the purchaser shall not require any earlier title nor abstract of title from the vendor, nor any other deeds documents wills or muniments than (?) are in vendor's possession. The document is a complicated one, involving a large number of people. I am not aware of any of them having any other connections with Ashburton. 'Being the settlement in contemplation of the marriage of the said Sackville George Cresswell and the said Sarah Ann Bennett' where the undivided moiety of Sarah Ann Bennett's land was transferred to Cecil Edward Bewes and Richard Preston Bishop. 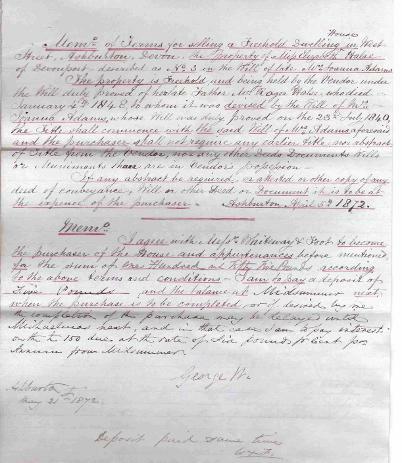 Sarah Ann Bennett appointed James Mayne to be a trustee of the Indenture of Settlement in place of Richard Preston Bishop. Agreement by James Edward Yonge, Cecil Edward Bewes and James Mayne with Edward Herbert Bayldon for sale to him of the fee simple of the lands thereinafter mentioned 'as being conveyed for the residue of a certain term of 1000 years for the sum of £3500. 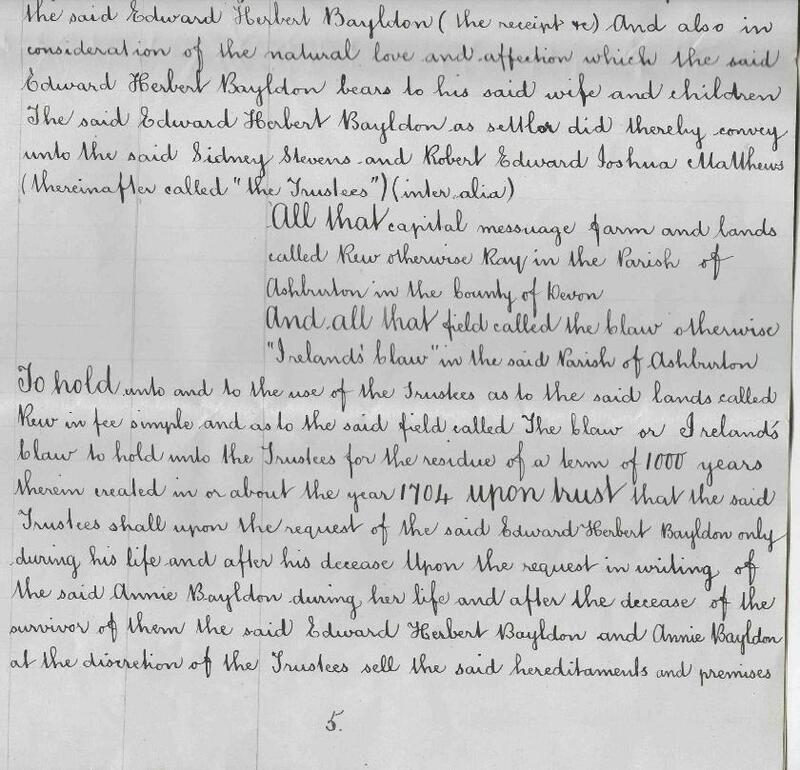 Above: Section of a document dealing with Rew and a field called Claw or Ireland's Claw. Edward Herbert Bayldon of the fifth part. 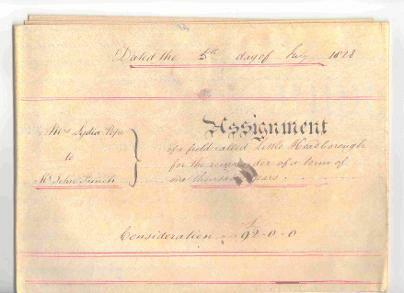 Edward Herbert Bayldon being in need of £200 was lent the money by Sidney Stevens, on condition that Edward Herbert Bayldon made provision for Annie Bayldon and her children. Rew otherwise Ray and the field called the Claw otherwise Ireland's Claw was conveyed to Sidney Stevens and Robert Edward Joshua Matthews as Trustees. After the deaths of Edward Herbert Bayldon and his wife Annie the trustees had the discretion to sell the hereditaments and premises. Mentions of Ashburton people in various sources. Mr and Mrs Hatch's notes on the cross at 14 St Lawrence Lane have now moved to Crosses and Holy Wells, a sub-menu of Churches and Memorials.